I made Zucchini Crostini! Just kidding. 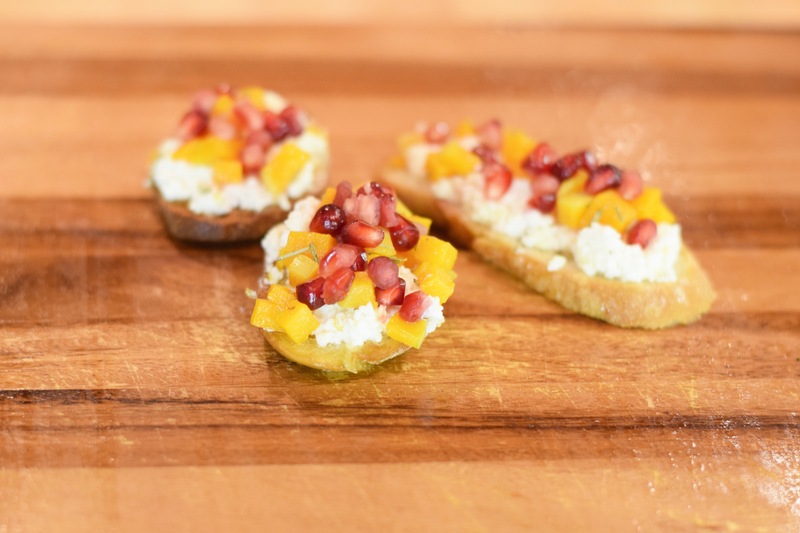 They’re Butternut Squash, Pomegranate with Lemon Ricotta Crostini, but Zucchini Crostini rhymed so well!! 🙂 Hey, I tried ok? Anyways, prepare your mouth for absolute deliciousness! I whipped these up real quick last Saturday when I had some friends over for dinner and OHMYGOD they were delicious! I served these as appetizers and then ate them for dinner. They were too good to have just five one! I hadn’t seen a recipe or anything to inspire me to whip this up, but I grabbed some things from my home away from home with the idea of crostini in mind. Note: I bought all my ingredients organic. They taste better and are better for you and the environment, but this recipe would work with non-organics as well. This definitely makes use of Fall produce, so making these in season will result in better tongue tantalizing deliciousness. Say that five times fast! First, pre-heat your oven to 400 degrees. Then a little prep; I cut my pomegranate in half and removed all the seeds using my favorite method: banging the back with a wooden spoon. Then I sliced my baguette on an angle, cutting long thin 1/4″ thick pieces. I placed the slices onto a cookie tray and sprinkled them with a little bit of olive oil. I, then, turned to the butternut squash and peeled it before cutting it in half. I saved one half for another meal and cut the other into pieces a bit smaller than 1/2″ cubes, but just a tad bigger than 1/4″ cubes. You want a whole bunch of pieces to fit on a single baguette slice, so smaller is better! I promise cutting the butternut squash is the most time consuming part. Once the pieces were cut, I spread them out on a cookie sheet and sprinkled a couple of tablespoons of olive oil over them and tossed them with a wooden spatula. When the butternut squash cubes were well oiled I took out my rosemary. I cut a bunch of rosemary from my parent’s garden whenever I visit them and dry it myself. Rosemary is my absolute favorite herb. My mother calls it my “Signature Herb!” I use it all the time! I scattered a couple teaspoons of rosemary, a bit of salt, and some pepper over my butternut squash and tossed it again, then popped the tray into the oven with the baguette slices. Watch your squash like a hawk! At 400 degrees Fahrenheit, tiny butternut squash cubes and then baguette slices cook through in just a couple of minutes! Mine took only about five minutes until the squash was hot and soft and the baguette slices were just starting to turn golden. While the squash and bread is in the oven, take out your ricotta cheese and dump it out into a mixing bowl. I took my microplane and grated the lemon rind into the bowl. I used one lemon worth of zest, then cut the lemon in half and juiced half of it into the same bowl. I mixed the ricotta gently with a fork and added some salt and paper to taste. Once I’d finished the ricotta, the butternut squash was done cooking so I took it out of the oven and put it on top of the stove so I could begin assembling the crostini! To assemble, I set up a little line with the bread slices first, then the ricotta, then the butternut squash, and ended with the pomegranate and a nice platter. I took a spoon and smeared a small amount onto one of the toasted baguette slices, then — using another spoon — gently layered butternut squash on top. I finished it off by sprinkling on the pomegranate seeds. I couldn’t make them fast enough! My guest were eating them off the platter before I could finish putting together the next one! These crostini are simple, easy, and delicious! The tastes combine in a wonderful and unexpected manner. The crostini are decidedly very Autumn! Perfect for a cold blustery November evening! Who knows, I may even make them again for Thanksgiving dinner appetizers! This is the kind of hors d’oeuvres that seems fancy, but really takes very little skill! Have you whipped up any quick appetizers lately? Tried making these crostini? Let me know!